← How Much Is My Blog Worth? And the winner is Jennifer! Back on January 30th we announced the winner of the digital photo for being the twenty thousandth visitor to the site. The winner has asked for a surprise photo from Turkey. 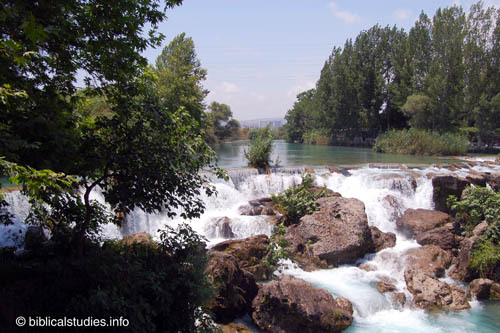 So, I have decided to send her a photo of the waterfalls on the outskirts of Tarsus in Cilicia, the hometown of Saul (Paul, the Apostle). Here is a small copy of the image I am sending to the winner. Tarsus was important historically. Because of its position on the River Cydnus near the Mediterranean about 30 miles below the Cilician Gates, Tarsus in Cilicia served as one of the great crossroads of history. Paul described his hometown as “no insignificant city” (Acts 21:39; 9:11; 22:3). It was a fortified city and trade center as early as 2000 B.C. It was captured by the Assyrian kings Shalmaneser III (833 B.C.) and Sennacherib (698 B.C. ), and had seen the likes of Alexander the Great and Cleopatra. Tarsus was commercially important. Ancient writers mention the linen woven here from flax which grew in the fertile plain. A material called cilicium was woven from goat’s hair and used to make coverings which would protect against cold and wet . If a man was destined to be a missionary to the world at large, there was no better place in all the east for him to grow to manhood than in Tarsus” (The Mind of St. Paul, 25-26). It is not difficult to imagine that famous leaders and armies stopped by this waterfall to be refreshed before (or after) making their way through the Cilician Gates. And it is easy to imagine that young Saul and his friends often visited the site. This entry was posted in Bible Places, Bible Study, Photography, Turkey and tagged Paul of Tarsus, Waterfall. Bookmark the permalink.